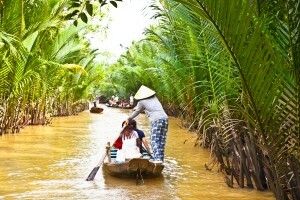 Come visit the Mekong Delta region of Southern Vietnam to discover hidden wonders. Ecotourism is a strong industry in this lush tropical region. Cruise down the Mekong River in a boat taxi and discover a world from the past. 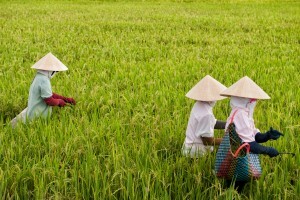 Floating markets, ancient temples, fruit orchards, museums, and scenic rice paddy farms dot the area. 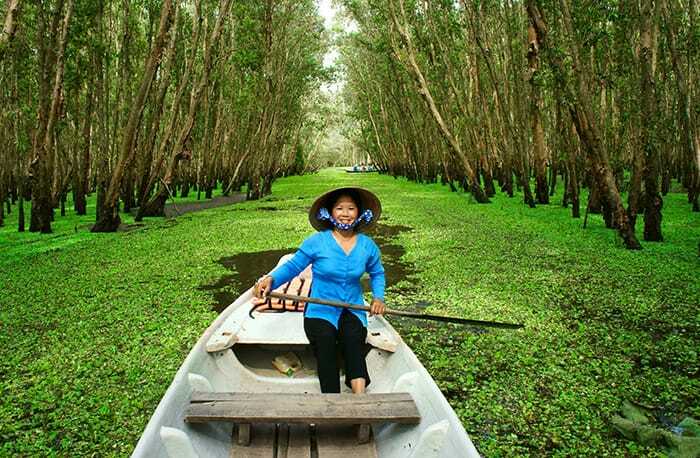 Here are 7 must see sights in the Mekong Delta of Vietnam. 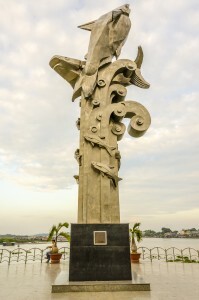 Famous Fish Statue in the town of Chau Doc, on the waterfront. Situated along the river, you can explore the town of Chau Doc’s monuments, mosques, and temples, as well as a vibrant marketplace. From the De Dao Trang Plaza to the Chau Phu Temple, you’ll find many cultural and religious sites to explore. The Chau Giang Mosque and the Murbarak Mosque are located across the river and are worth a trip, and there are many short boat taxis available for a quick trip. Buddhist temple at the base of Sam Mountain. Sam Mountain sits near the city of Chau Doc, and climbing the relatively small but stately peak is a cultural as well as scenic experience, as you will pass dozens of shrines, tombs, relief statues, and even a temple (the Phat Thay An Temple, at the base of Sam Mountain). The short climb is regarded as a pilgrimage for many Vietnamese and Chinese. At the top of the peak, there’s a small military outpost, where you can enjoy stunning views looking into Cambodia on one side and Vietnam on the other side. 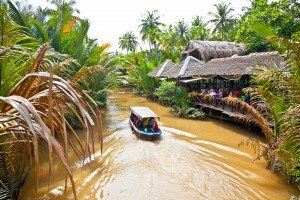 Top tourist attractions are the scenic boat cruises along the Mekong Delta. This one departs from Ben Tre village. One of the most enjoyable ways to experience this region is by taking a boat cruise along sections of the Mekong River. From Vin Long or My Tho, there are several tours taking visitors along the river and its various canals daily. Some tours stop at flower farms, rice paper factories, and nearby temples. Every tour you take will lead you past thick forests of palm trees, rice farms, and villages. 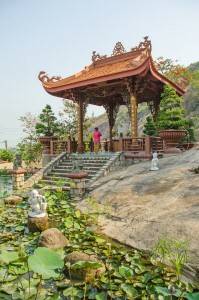 Daily tours are offered at the Vinh Trang Pagoda. A favorite tourist spot, this pagoda is located in My Tho (near Ho Chi Minh City). 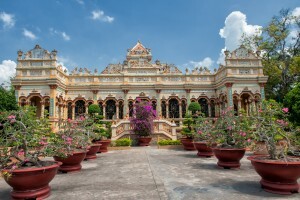 This stately and elaborate building (built in a combination of eastern and western styles) has mosaic decorations made out of broken pottery. Farmers sell their produce in floating markets in the Mekong Delta. Quintessentially Vietnam, the floating markets of the Mekong Delta show a vibrant part of local life in this thriving agricultural area. 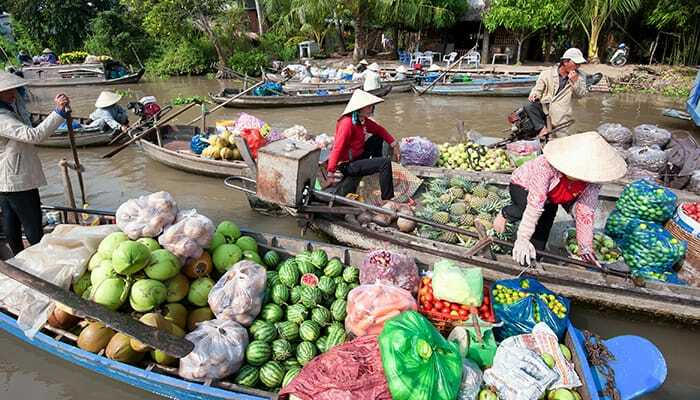 You can buy pineapple and other tropical fruits from the growers themselves in boats. Most of the rice exported from Vietnam is grown in the Mekong Delta, and there are many fruit orchards and flower farms here as well. Boat tour in the Tra Su Indigo Forest, Vietnam (during high water season). This fascinating ecotourism site in the An Giang Province is a vibrant (but dry) forested area most of the year and it turns into a flooded forest in September and October, during rainy season, which are considered the best times to visit the region. During high water season, you can take a guided boat tour through the forest from Ho Chi Minh City. 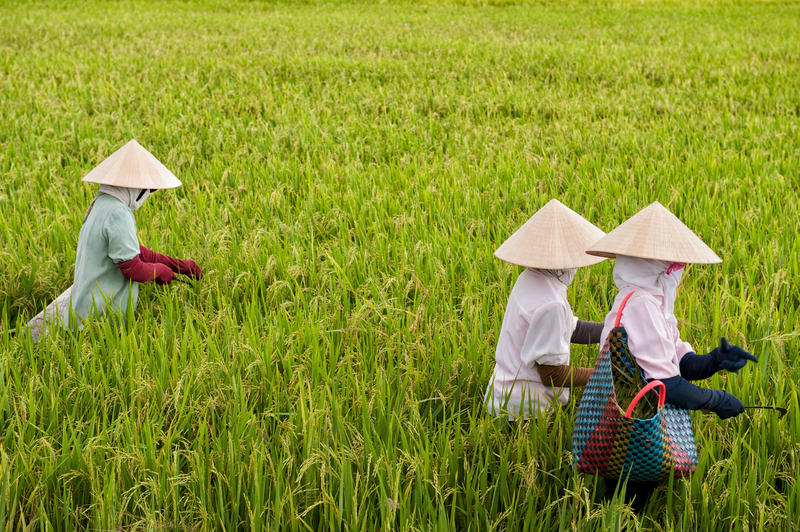 Vietnam is the third largest exporter of rice in the world, and most of the country’s rice is grown in the rich fields of the Mekong Delta. The Mekong Delta has the richest farmland in the country, which is why the area has been fought over by neighboring countries for thousands of years. The region offers some of the world’s most interesting eco tours of rice paddies, fruit orchards, flower growers, and riverbeds. Taking tours in this area supports the local economy and encourages responsible environmental stewardship. 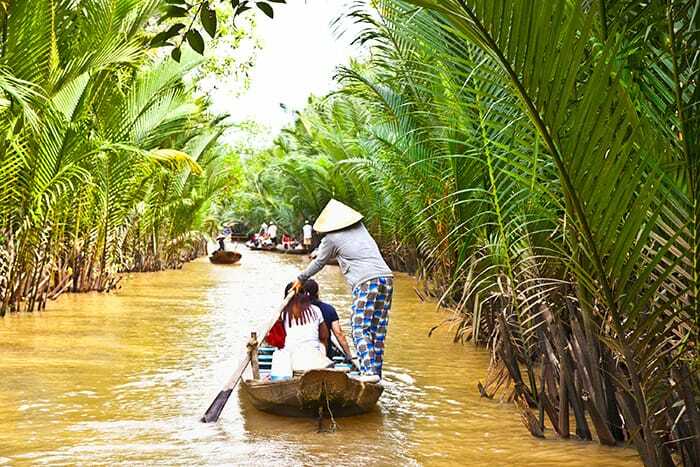 Are you ready to embark on an unforgettable trip to the Mekong Delta? Ecotourism in the Mekong Delta is an escape from the everyday and an adventure like no other. Make sure you get your Vietnam visa before you start your trip. You can avoid the hassle and get your visa the fast and easy way at Vietnam Visa.